The original Moto E was a dinky entry-level smartphone that offered the perks of an up-to-date operating system while letting you perform most tasks without much flashiness. The Moto E (2015) features a quad-core processor, Android Lollipop and 4G, but is externally identical to its predecessor. This gives it the framework of a solid, all-rounder handset. Read our Moto E (2015) review to find out if a few tweaks here and there are enough to make it a winning entry-level handset. The Moto E (2015) release date was February 26, so it's now available to buy in the UK, US and around 50 other countries. The 4G/LTE version reviewed here costs £109.99 in the UK and $149 in the US, with a similar Moto E (2015) price expected in other countries. The look of the Moto E says “affordable but sturdy”. With its relatively small 4.5-inch screen and plastic chassis, it doesn't feel like it's trying hard to look like a higher-end device (the fact that it comes pre-loaded with Android 5.0 Lollipop does that job). That's in no way saying that the matte plastic finish on the Moto E design looks bad. The phone has a very smooth, rounded look, with a textured band wrapping around the rim to improve grip. Interestingly, the band needs to be prised away to reveal the hidden microSD and SIM card slots. This seems like a great solution to giving the phone a clean-looking design, while not going to the other extreme by forcing you remove the battery to access your card slots; a deft piece of design. At 12.3 mm thick, the Moto E is a bit on the dumpy side, though I don't think a few flabby millimetres round the waistline in any way detract from the phone's usability. On the front, the Moto E (2015) has done away with the visible bottom speaker of its predecessor, leaving only the silver-bar top speaker and a front-facing camera underneath a layer of Corning Gorilla Glass. At 4.5 inches, the Moto E (2015) display gains 0.2 inches on its 2014 forebear, and by sticking to the same 540 x 960 resolution, it loses a few PPI in the process. In this day and age, the screen feels a bit on the small side, especially when you can now get a 5-inch display for £75 in the form of the Honor Holly – with a better resolution too. With that said, if you're not too bothered about size and resolution, then the IPS LCD screen on the Moto E is bright and colorful with decent viewing angles – perfectly sufficient for the casual user. The quality of the software on the Moto E (2015) can be summed up with just one word – Lollipop. While Android's latest operating system update may be gaining notoriety for its glacial rollout, it's easily the best mobile operating system on the planet. The fact that only 3.3 percent of Android users are running Lollipop so far should make Moto E (2015) owners feel all the more privileged. With Lollipop, nothing ever feels more than a couple of swipes away, and Motorola is committed to running the near-stock Android experience. In the camera, swipe in camera settings from the left, right to go to the gallery, and up and down to zoom. On the homescreen, swipe the notifications menu down twice to reach your basic phone settings. Lollipop is full of these little niches you can discover, and is a great evolution of the Android UI. There are few unnecessary apps on the Moto E. There's the Moto app, which lets you set times you don't want the screen switching on - such as when you're sleeping - or get the phone to send automatic messages to people trying to call you when you're in a meeting. The Help app is handy as well, offering tips as well as the option to instantly message or call the Motorola support team. With its quad-core Snapdragon 410 processor, the Moto E (2015) specs offer fantastic performance for the price. While there is the occasional stutter when gliding through the gorgeous-but-demanding Lollipop interface, for the most part the latest Android UI is more a boon than a bane to the Moto E.
In our AnTuTu benchmarks, the Moto E achieved a very respectable 21,856, nearly doubling the 2014 Moto E's score of 12,676, and even outperforming last year's Moto G and the more expensive Huawei Ascend G7 by a comfortable margin. While the Moto E isn't a gaming powerhouse, it did surprisingly well in the benchmarks, so we decided to throw it out into the field with the recent (and ridiculous) game, WWE Immortals. The 3D fighting game was playable, with slowdown only noticeable during bigger explosions. The Achilles Heel of the Moto E – as with its predecessor – is the 5MP rear camera, which will give your snaps that 2007 look. There is no flash, and pictures are prone to looking noisy unless you're in optimal light conditions. The software redeems the camera slightly by featuring an automatically-enabled HDR mode, which saved many a photo that we took. The camera app has some intuitive touches, and most functions can be carried out with a couple of swipes (dragging your finger up and down anywhere on the screen to zoom is a nice touch). The editing options are decent too, but overall the camera feels a little 'last-gen' – especially when for lower a price you can get a decent 8MP snapper on the Honor Holly. The 0.3MP VGA front camera deserves little more mention than this oversized footnote. The 2390 mAh Moto E (2015) battery is a small step up from the 1920mAh battery of its predecessor. You should be able to squeeze over a day's moderate use out of it which, while not a spectacular figure, is reasonable for the price point of this handset. The Moto E (2015) updates last year's version of the phone in some important areas, boosting the processing power and updating to Android Lollipop. It did, however, neglect doing much to upgrade the woeful front and rear cameras on the 2014 model. With the rise of budget phones from Chinese competitors like Huawei, £109.99 is also not as enticing a price tag as it was a year ago, but the Moto E (2015) does manage to outperform phones that are more expensive than it, so it still equates to good value for money. Don't be fooled by the cutesy look, the Moto E (2015) packs some deceptive power for the price. If you're after a phone that will make you feel on-trend with features like Android Lollipop and 4G, then this is a very good budget option - just don't expect much from the photography. 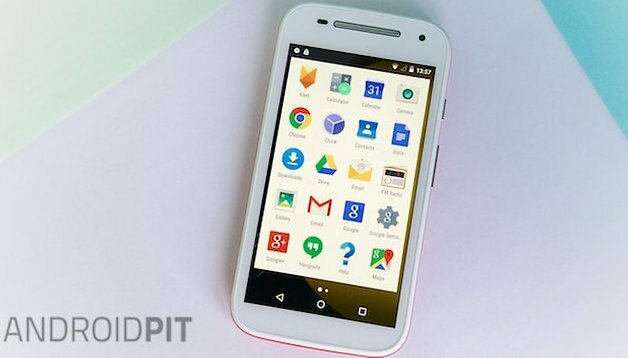 Has our Moto E (2015) review swayed you towards getting one? Or do you already own one? Let us know your feelings about it in the comments. Finally, a review that hits all the important points without going on and on. Thank you.